On the 23rd and 24th a big group from Singapore and the Charming Tour group came to the 3rd school to help prettifying the front of the school. 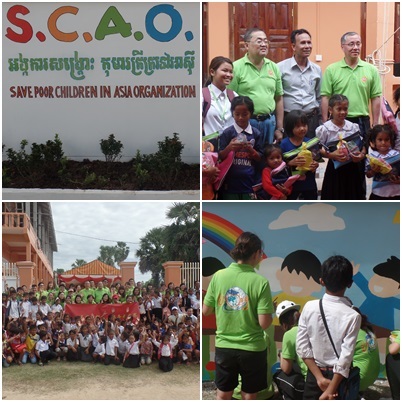 They grew some plants, painted the walls and of course put the scao logo on the entrance. Besides helping out with that, they organised such a great day for the students. Everything was perfectly planned from the beginning to the end. First the 150 students got Khmer curry for lunch, which they really enjoyed, thanks to all the old ladies from the village for cooking! After some rest they played loads of games, starting with some group games that included English worksheets and followed by many stations, each group needed to go through, to finish everything. After they all finished, the groups got ranked and all the students got some presents, like books, pens and sweets. It was such a happy day for everyone. We would like to thank our friends from Singapore again for all your support, effort and enthusiasm you put into the 3rd school! You did such a great job. We wish you all the best and hope to see you again soon. Help us with your donation!